I was in Iloilo City recently to speak at the Tourism and Hospitality Students' Congress Nationwide Caravan - Iloilo Leg. As always, food tripping was also on the agenda! It was recommended that I try out Carlitos Restaurant which comes from the owners of the Original Biscocho Haus. The restaurant is named after Dr. Carlos Guadarrama whose food mantra was a balanced diet, way before the advent of the food pyramid. The bestseller is Steak ala Teresa, the matriarach’s version of luscious, moist and sizzling choice beef tenderloin. 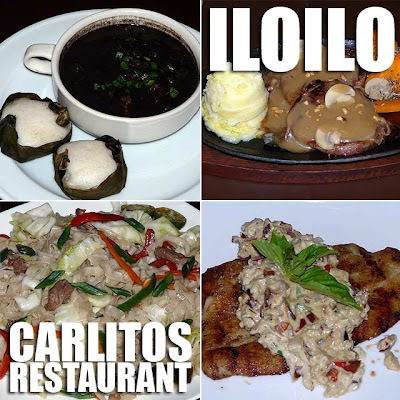 The original branch of Carlitos Restaurant is along the National Highway in Pavia. But they opened a new branch beside the Biscocho Haus in Jaro. They serve some local Iloilo favorites. But the menu choices are plentiful since they also serve pizza, pasta, meats and seafood, burgers, sandwiches, breakfast and dessert among others. Perennial family favorites like Ox Tongue and Callos are made available. I tried out their pizza best-sellers: Carlitos Overload Pizza with everything on it, and Teresa's Spanish Pizza, with Spanish chorizo on mozarella cheese. Both were really good! For the local food, we had Teresa's Special Efuven (egg noodles with pork and vegetables), and their Dinuguan which is served with Puto Manapla. The Pancit Efuven, cooked light and delicately herbed, is an heirloom recipe of the Guadarramas of Fajardo Street. I also tried out the Carlitos' Steak (beef tenderloin served with a special steak sauce) and the Fillet Steak (which is seasoned with herbs and spices and covered with a creamy crabmeat sauce). 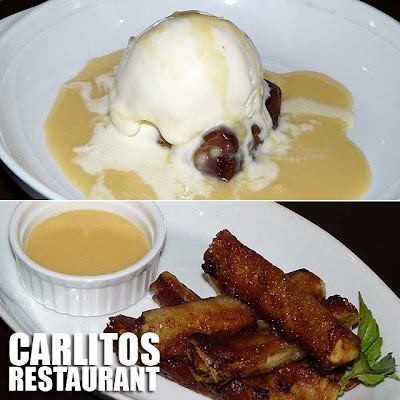 For dessert, I highly-recommend the Butterscotch a la Mode (which is the famous Biscocho Haus butterscotch topped with vanilla ice cream and their homemade custard sauce) and the Banana Fritters (their version of turon but served with their really rich homemade custard sauce). You also might want to know that Carlitos’ Jaro branch has live music on Fridays, Saturdays and Sundays with pica-pica to match light drinks on its alfresco T-Grillhouse. After dinner, I walked over to the Original Biscocho Haus store to buy goodies to take home. On top of the list was butterscotch. I got introduced to this really yummy butterscotch way back in high school and I've been a fan ever since. Aside from the original flavor, they've innovated and created some with dried fruits such as prunes and mangoes. Biscocho is another main product. That's why they're called the Biscocho Haus! They also have the Ilonggo favorites which include barquillos and piaya. 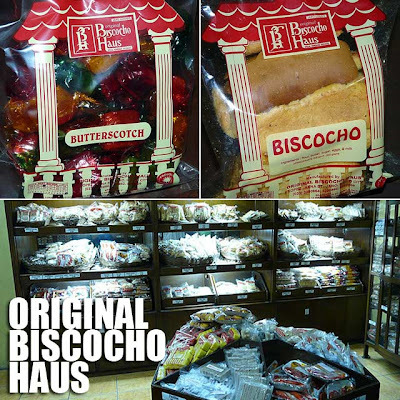 I was actually amazed at the variety of products the Biscocho Haus now produces. 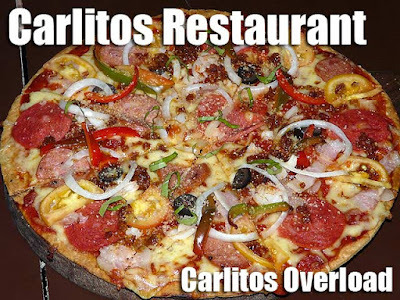 Same reviews with their CARLITOS OVERLOAD pizza. Everything's good especially the crust. their dinuguan plus puto manapla is also a "killer" combo. You haven't mentioned about Biscocho Haus' YEMAS which is IMO one of the best. Next time do try it, it's more addicting than their butterscotch. Their garlic and buttered toasts also are very good.